Why is the egg of an aging female less likely to result in a pregnancy and more likely to result in miscarriage or an abnormal baby than that of a younger woman? Why is it that a young egg placed into an older woman results in a high pregnancy rate, while an egg from an older woman results in an extremely low pregnancy rate? How can we now prevent Down syndrome, or other genetic diseases, without the need for amniocentesis and pregnancy terminations? It’s all in the DNA. With the emergence of DNA technology, we can help to ensure with IVF that you have a healthy baby. Otherwise fertile couples who are carriers of genetic diseases such as Tay-Sachs, cystic fibrosis, retinitis pigmentosa, hemophilia, Huntingtons, Marfans [see video], and so on, can now use this technology to be assured that they will have normal children. We can easily screen couples for such genetic risks before they ever decide to have children, and if they have such a risk, preimplantation evaluation of the embryos can save them from having a child who would otherwise die or be handicapped with severe defects. Various stages of follicles in the human ovary. The antral stage follicles can be counted with ultrasound and tell us how many more years you have left to conceive. Several years ago, a 27 year-old woman with Marfan’s disease (inherited from her father) came to my office with her fiancé. She was told quite correctly by her doctors that a pregnancy could easily be fatal to her because of her condition (which results in a weakened main blood vessel in the chest and leaky heart valves). She was about to be married the following year, and she came in with her mother and father, proposing that her mother be a surrogate and carry her baby via IVF. She was surprised when we told her that not only could her mother be a surrogate and carry her baby, but that as long as we were doing IVF anyway, we could test her embryos (derived from her eggs and her husband’s sperm) before placing them into her mother, and transfer only the healthy ones. Thus, not only could we allow this woman to have a child safely via IVF and gestational surrogacy, but we could also assure her of having a baby that would not carry her disease. Removing a polar body from the egg for genetic testing. Most patients who had previously delivered a child with Down syndrome or had elected to have such a pregnancy terminated simply would not ever try again to get pregnant and undergo the risk of enduring this agony once more. Even patients with cystic fibrosis, who are managing to survive with modern medical treatment, tell us that they don’t want their baby to have cystic fibrosis. Using IVF, we can test their embryos and put back only the healthy ones, thereby avoiding these heart-wrenching problems. 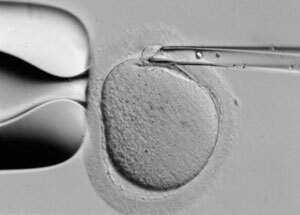 For obvious ethical reasons, the unhealthy but viable embryos can be frozen and saved for a future date when gene therapy would be able to correct the genetic defect.